Click on pics for a larger version. 11291 Simplex loco article – more about these locos from Motor Rail Ltd.
11296 Newspaper cutting from the ‘Sheffield Star’ 5-4-1963 Re. Flying Scotsman RPS Trip. 11316 An Award given to the Chasewater Railway. From Steve Organ’s collection. Many of you will by now have seen our splendid new locomotive. Two years ago exactly to the day that she left Trafford Park, I first found ‘Asbestos’ – 15th June 1966. She was not working on that particular occasion and had been specially hauled out of the shed for me and put in a photographic position. She appeared in excellent condition. On the occasion of my visit I learnt that she was likely to finish working that September, and I duly put in a bid for the RPS. I was informed that the Society’s interest had been noted. A little over a year later a letter arrived from Turner’s asking me if I would care to bid for the engine – I made an offer of £50, and shortly afterwards received a telephone call informing me that a scrap merchant had offered £100 – we could have her if we could reach that figure. By this time we were in October and I was already engaged in trying to raise funds for the Neilson. My reply said that if they could hold the locomotive until after our Christmas raffle, we would do our best, but I did not hold out a great deal of hope. Considering all things, the raffle was a success, but we did not raise the sums necessary to allow us to move in two directions and I informed the Company that we would have to let her go. My surprise could not have been greater, when Mr. Francis, the manager of the buying department, rang me to say that we could have ‘Asbestos’ free of charge. Without doubt this was one of the happiest days of my life. I made arrangements to go to Trafford Park to arrange the handover and had an excellent morning. The handover was arranged for a date three weeks later when the presentation plaque could be fixed to the locomotive. I could not have been dealing with nicer people throughout the negotiations, right from the time of my first visit to the works. 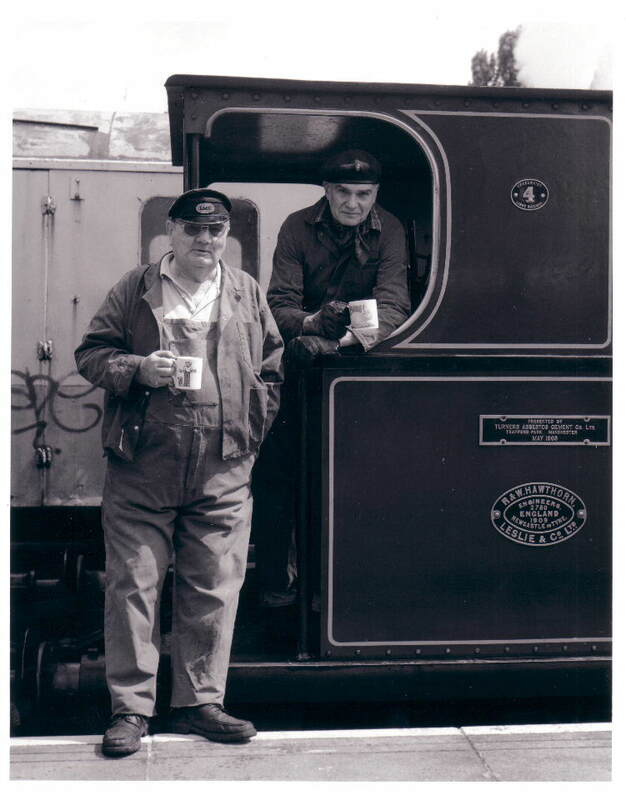 Our thanks must go to Mr. A.H.Wailes, the Works Director, Mr. T.Noble, the Purchasing Director, Mr. T.N.Chadwick, the Works Manager, who also arranged for the locomotive to be ‘done up’ for us during the week before the handover, to Mr. W.D.Francis, the Purchasing Manager, who dealt with most of the negotiations and Mr. S.McCormick. Little is known of the history of ‘Asbestos’. She was built by Hawthorn Leslie in 1909, for the Washington Chemical Co. in County Durham, where she became No.2, along with two other Hawthorn Leslies and a Fox Walker engine. A further Hawthorn Leslie was added in 1918, and presumably replaced the Fox Walker. In 1920, the Company became part of the Turner and Newall group. 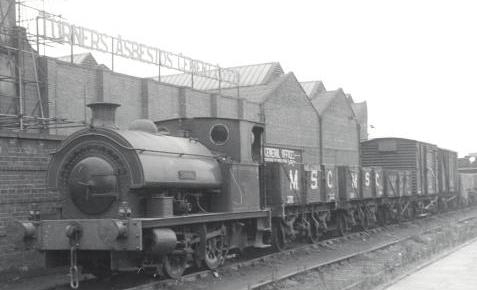 In 1933, two of the locomotives were transferred to the Turner’s Asbestos Cement Company works at Trafford Park, becoming ‘Turnall’ and ‘Asbestos’. Turnall was scrapped in 1965, leaving ‘Asbestos’ with two diesel locomotives (Planets). ‘Asbestos’ was placed in store as the reserve engine in 1966 and presented to the RPS on 25th May of this year(1968); she was transferred to Chasewater on 15th June, and started work in revenue service eight days later.